"Skopje Diplomatic Club" proposes the renaming of Skopje's airport from "Alexander the Great" to "Kyro Gligorov"
The renaming of Skopje’s airport from “Alexander the Great” to “Kiro Gligorov” (former FYROM president) proposed diplomats in the country, an idea that seems to be accepted by Prime Minister Zoran Zaev despite the strong objections expressed by Nikola Gruevski’s main opposition party VMRO-DPMNE. In particular, Skopje’s “Diplomatic Club” said on Friday it supported initiatives for the renaming of Skopje’s airport and proposed to take the name of former President of fYROM, Kiro Gligorov. The Skopje Diplomatic Club, in a related statement, states inter alia that the renaming of Skopje airport to “Kiro Gligorov” will depict in the most dignified way the appreciation for the important role played by the late president of the country Kyro Gligorov in the process of establishing the modern state of FYROM and will indelibly seal the collective memory of its citizens. The “Skopje Diplomatic Club” is a group that consists mainly of former and active diplomats of FYROM and aims to “promote the professional and social life of diplomats in Skopje”. Members of the former diplomatic service of fYROM, as well as foreign diplomats currently serving or having served in Skopje, have the right to participate as members. Prime minister of fYROM Zoran Zayev, responding to a relevant question, said he sees the idea of ​​renaming the airport to “Kiro Gligorov” as acceptable in principle. “At first sight I like this idea. But I am only one of the citizens of the country. I want to listen carefully to the citizens. Let’s start a debate and we will hear what the citizens will say”, Zaev said. For their part, the right-wing nationalist party VMRO-DPMNE has opposed the renaming of Skopje airport and noted that “when they comes back to power they will cancel the denominations and restore what Zaev and his government are tearing down”. VMRO-DPMNE in their statement further accused Zoran Zayev and his government of “undermining national interests” in fYROM and noted that “the intention to rename Skopje airport is the latest of a series of concessions made by Zajev, against the country”. Skopje’s airport which was previously known as the “Petrovice”, was renamed in December 2016, by Nicholas Gruevski’s government at the time, to Alexander the Great Airport. At the airport there is a statue of Alexander the Great, which was installed by the Turkish company TAV, which manages Skopje’s airport. A few days ago, Zavev, speaking to Montenegro’s Antenna M radio station appeared ready to discuss a change of his country’s name in order to reach an agreement with Greece and begin the NATO and European Union accession processes. As the prime minister of fYROM said, his desire is for good neighbourly relations with Greece, which, in order to be achieved, there must be an agreement on the name issue. “It is important to focus on the problem that Greece has with our constitutional name. I believe that there will be a solution and a way to come up with the new name. In the end, what is important for us is to find a solution for the name, because not only will we receive a call for NATO membership but also we will be able to start negotiations with the European Union,”, the Prime Minister of FYROM had underlined, while calling for the invitation to join NATO, an incentive to find a “common language” with Greece. From the Greek side, the Greek government wants to become clear both to the EU and Washington, that Greece wants an immediate solution to all outstanding issues with its Balkan neighbours, fYROM and Albania. The preventive initiatives of the Greek Foreign Ministry towards Tirana and Skopje, beyond their obvious dimension, are also targeting the international player, above all Washington, which is keen to stabilize the Western Balkans. Besides, on the last trip made by Greek Prime Minister Alexis Tsipras in Washington and the contacts both himself and Mr Kotzias had with US Vice President Mike Pens, as well as the most extensive discussion the Foreign Minister had with the National Security Adviser Mr Macmaster, there was a very strong convergence of views for the Western Balkans. 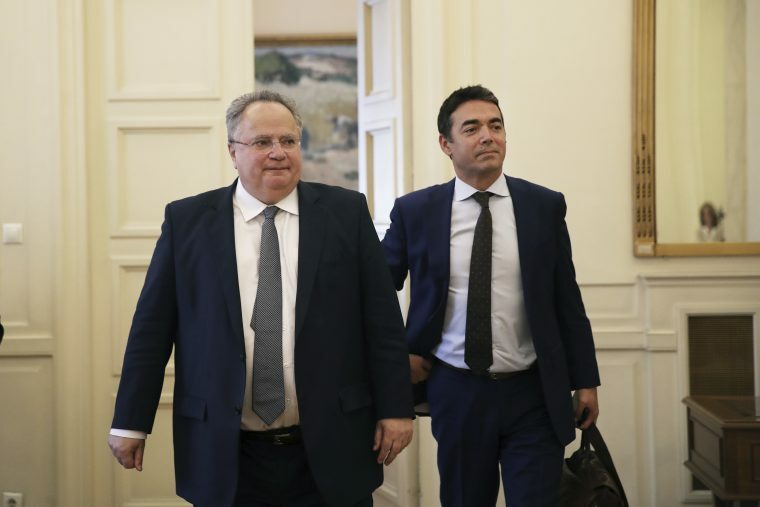 Nikos Kotzias will travel today to the Foreign Affairs Council of the EU in Brussels. There, inter alia, will take place a working breakfast for EU foreign ministers with their fYROM counterpart, Nikola Dimitrov. The next intensive talks will be about the nomenclature dispute with FYROM, with Mr Kotzias preparing them with feverish pace.